Thanks to several tips and leads, detectives were able to identify the male adult. His loved ones have been notified. Los Angeles County Sheriff’s Missing Person Unit Investigators are asking for your help to identify a man that was found at a local fast food restaurant after he suffered a medical emergency and was transported to a local hospital. The incident occurred Tuesday, December 14, 2018, on the 3100 block of South Hacienda Boulevard in Hacienda Heights. He has no identification, is currently disoriented and cannot answer questions. Any information could help investigators identify this man and locate his loved ones. 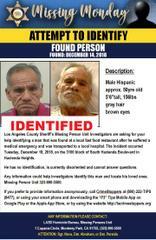 Missing Person Unit 323-890-5500.